Feel the difference with the next generation of lightweight safety footwear. MASCOT® FOOTWEAR MOVE is super lightweight safety footwear in a modern, sporty look made of the most innovative materials in the well-known MASCOT quality. 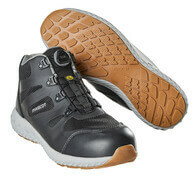 The footwear in MASCOT® FOOTWEAR MOVE is among the lightest on the market. The low weight is obtained with the use of innovative production techniques and materials. The toe cap is made of a lightweight composite, and the nail protection is made in an advanced special textile that makes the footwear very lightweight and very flexible. 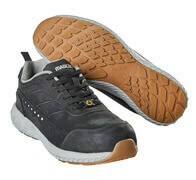 This ensures that the footwear is very comfortable to wear and that it is possible to easily move around all day. The unique midsole in the innovative Phylon material is what makes the MASCOT® FOOTWEAR MOVE collection special. The Phylon sole is made of EVA and is produced using a special compression technique that transforms it into a firm, tough foam that when added air bubbles gives an extraordinary light and flexible sole. 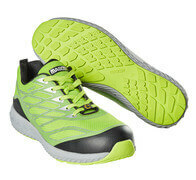 The MOVE collection also has a shock absorbing, flexible insole that can be removed as needed. The light and flexible sole materials make the safety footwear in MASCOT® FOOTWEAR MOVE comfortable to wear throughout the work day. The MOVE collection is designed with a modern, sporty look. 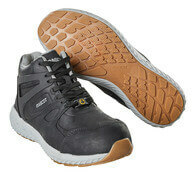 The footwear is suitable for people working as a craftsman in light industry or logistics. The collection’s modern design allows for you to wear them when meeting up with friends or stopping by the grocery store on your way home from work. In short, the MASCOT® FOOTWEAR MOVE collection is modern safety footwear that is smart and comfortable which entails that you don’t want to take them off. The footwear is both available with the traditional lace closing and with the Boa® Fit system. Several of the models are available in both men and women’s sizes. 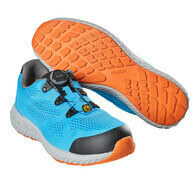 Even though the MOVE collection looks like a modern sneaker, it doesn’t compromise in turns of quality or safety. All the models in the collection are produced with an outer sole in natural rubber that makes the footwear heat resistant up to 300 °C contact heat. The safety footwear in the MOVE collection also comes with a heel reinforcement and non-marking outer soles that do not leave marks on the floor. The complete MOVE collection is ESD approved as well as EN ISO 20345:2011 safety class S1P or S3 approved.